The International Club is a Willard Byrd designed course and located in Murrells Inlet. Soon after opening, the course gained popularity and became one of the most enjoyable golf courses in Myrtle Beach. Golfers of all levels can play Byrd’s 18-hole course since the design features five sets of tees. The experienced golfer will find this par 72 course with a range of 4,838 to 6,857 yards to be a test of man vs. nature. Accurate shooting is a must as golfers navigate past soaring trees, sand bunkers, and water hazards. Meanwhile, the rolling fairways and champion greens create a pleasing backdrop. Golf Digest recognizes the International Club as one of the Best Places to Play with a 4 Star rating. After golfing, visit the 6,400 square foot luxury European style club house and relax with your golf buddies. 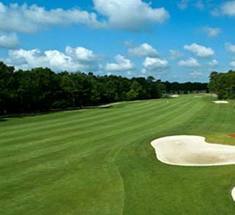 The International Club is a Willard Byrd designed course and located in Murrells Inlet.